Did anyone know that the real Luxor is nothing like the Vegas version at all?? .....yes?? Right. Me too, obviously. 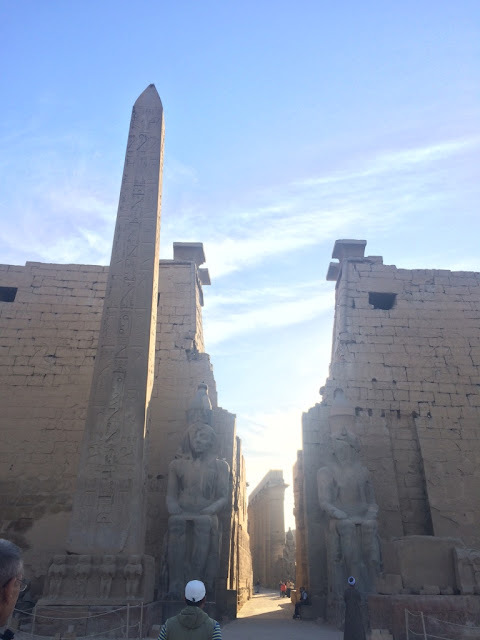 So given that I spent entirely too many days in Cairo happily putzing around (which basically means I robbed the Marriott of all their free waters and donuts), I finally made a move and took a overnight train down to the city of Luxor = lots of famous, amazing temples and tombs. And I mean lots. 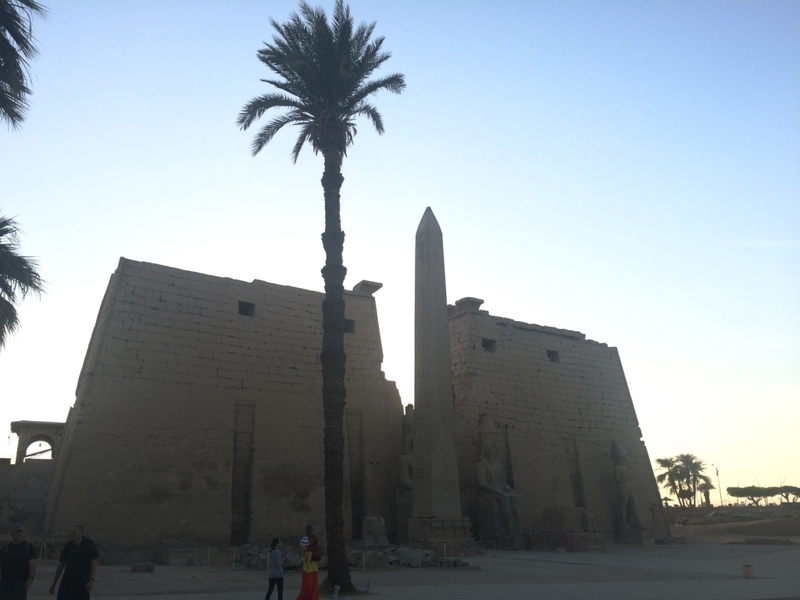 Luxor! 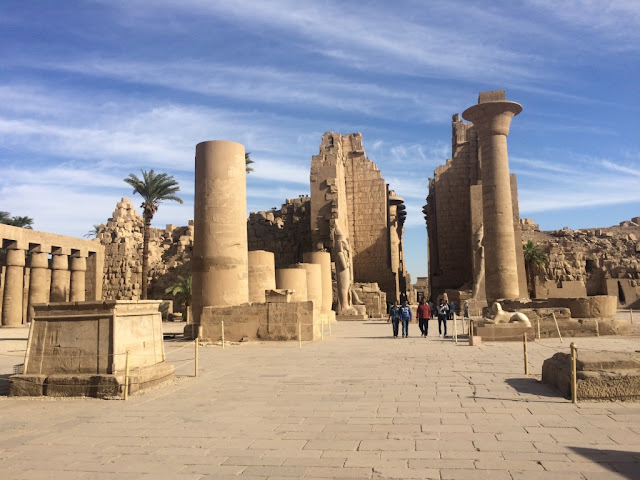 City that is very South of Cairo, located off the Nile River, and the former site of the ancient Egyptian city of Thebes - therefore there is a plethora of amazing, fascinating ancient ruins. Luxor is divided by the Nile River into the West Bank and the East Bank - the East Bank has the ruins of the temples of Karnak and Luxor (which again, Vegas - you were very misleading), and the West Bank is a giant necropolis with tons and tons of tombs, such as the Valley of the Kings (for pharaohs) and the Valley of the Queens (for everyone else royal). Took an overnight 9-hour train down to Luxor, which was definitely an adventure. 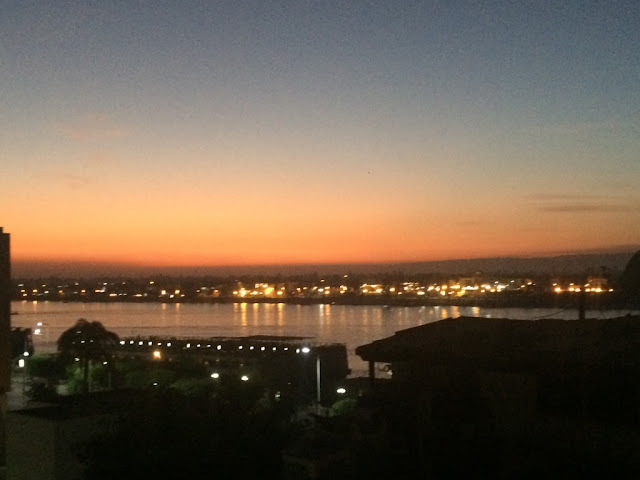 Given my talent of passing out on overnight vehicles, I only remember about 30 minutes of the actual ride - but from what I recall, the train looked like it was from 1950 and it rocked back and forth a ton and it was filled with locals who stared at me curiously. Zzzzz. 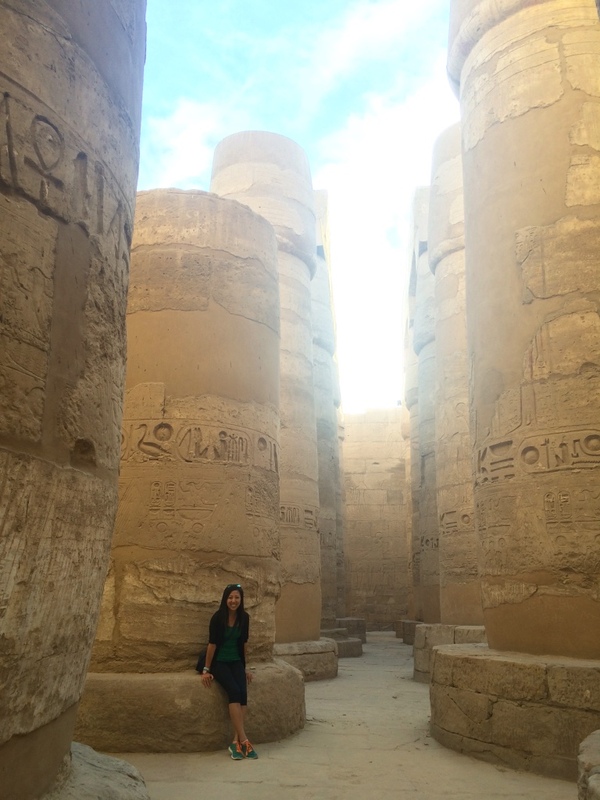 On Day #1, I joined a tour of the East Bank of Luxor - which includes the Karnak Temple and the Luxor Temple. Karnak is a one of the largest religious sites every constructed in the world - it's dedicated to a triad of Gods whose names I can never remember, but the God Amun is one of them. I'm sure that means a lot. You're welcome. Anyways, Karnak is huge and incredibly impressive - honestly, I am having trouble with how impressive everything in Egypt is. The buildings are freakishly large: the scale defies belief, and the amount of detail and work that went into them is insane. 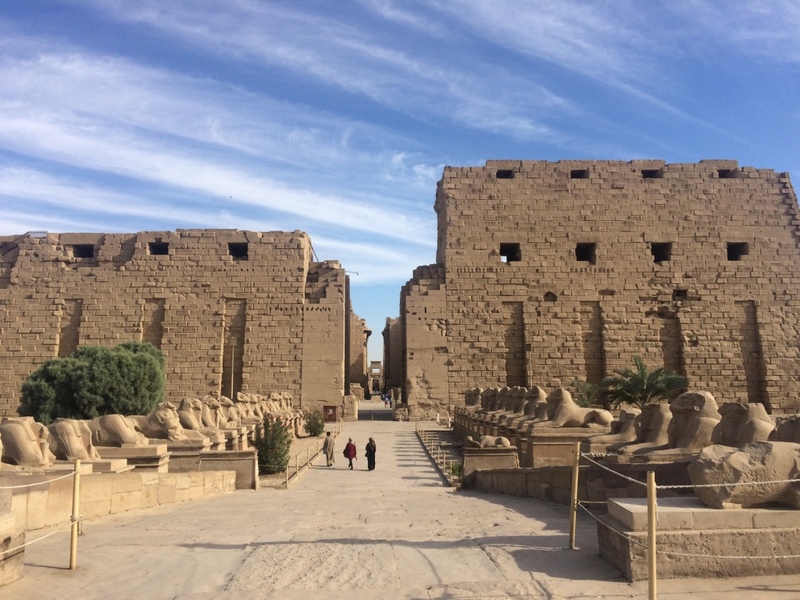 Karnak was built starting around 2,000 BC, all the way up to 20 BC - its construction and use lasted through several dynasties and pharaohs. TLDR: this thing is gigantor. Approaching Karnak Temple, you are greeted by 42 sphinxes, built by the man who built everything - Rameses II. 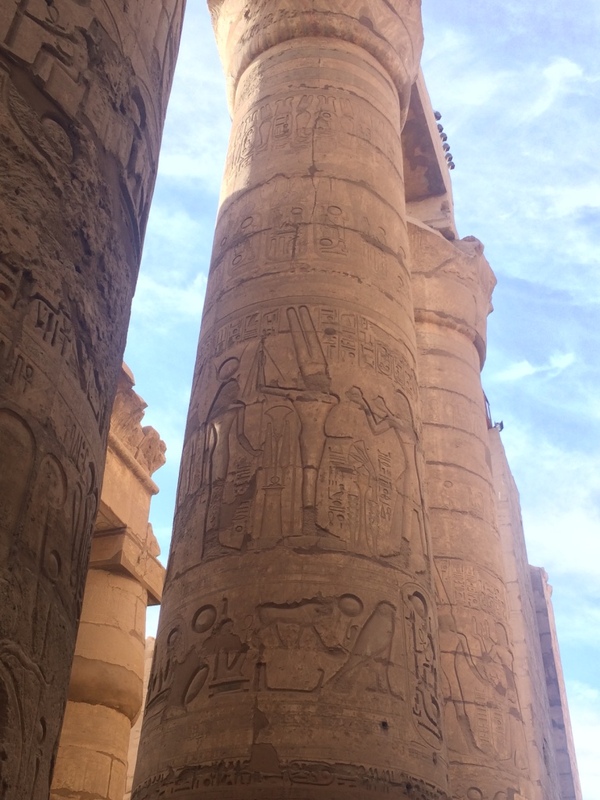 And here is the hypostyle hall. Huge. Exiting the hall are giant statues. Do you see the size of the walls compared with the tiny people?? 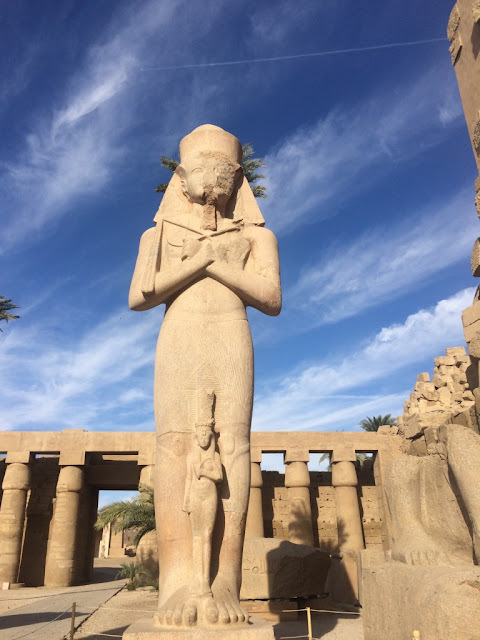 I'm going to take a wild stab here and guess that this is Rameses II, the king who loved himself and built most of the giant impressive temples in Ancient Egypt. He also had 68 wives and over 200 children, ruled for 67 years, and died at the age of 94, which was unheard-of-old back then. See?? HUGE. (Drinking game - everytime I say 'huge" or "giant." I'm going to preemptively guess ~50 drinks will be had). 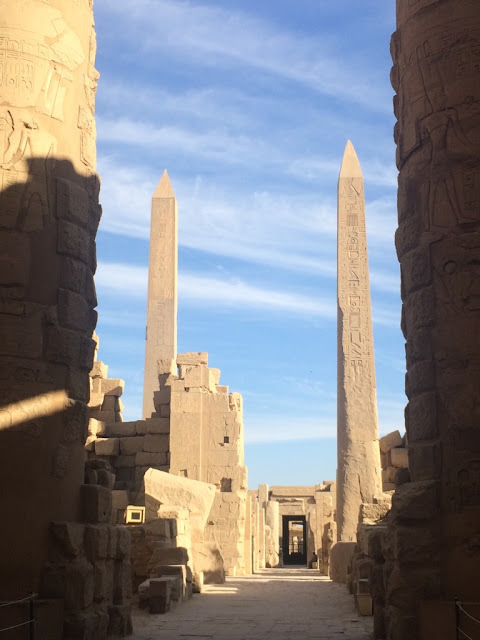 And then there are giant obelisks - which are all carved out of one stone, and the process to create them, move them, and place them in a certain location is a true miracle (it involves a lot of wood, ropes, sand, fake wall construction, ramps, and manpower). 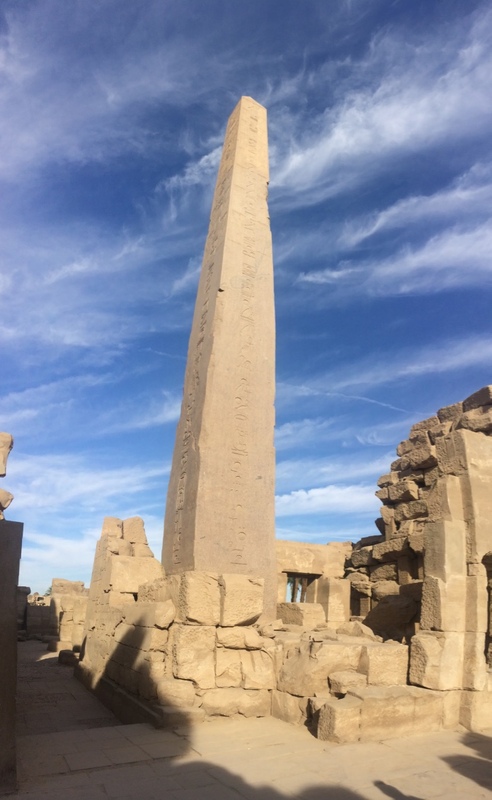 One of the largest obelisks ever (yes I said EVER), about 29 meters tall. And here is some obelisk detail. So neat. On my tour were two girls from China (both solo travelers as well). Quick side tangent, do we think that indicates that this crazy travel obsession is in my genetic pool?? Anyhow, they were great and the three of us stuck together for the tour and took photos for each other - and I thanked God that I have a solid 5th-grade Chinese ability, because it allowed me to understand enough of their conversation to nod along intelligently or contribute a word or two once in awhile - when in actuality, I could not understand a solid 40% of what they were discussing with me. I may or may not have given one of the girls completely wrong transit information about Jordan, because I didn't realize until 10 minutes in that we were even discussing Jordan. 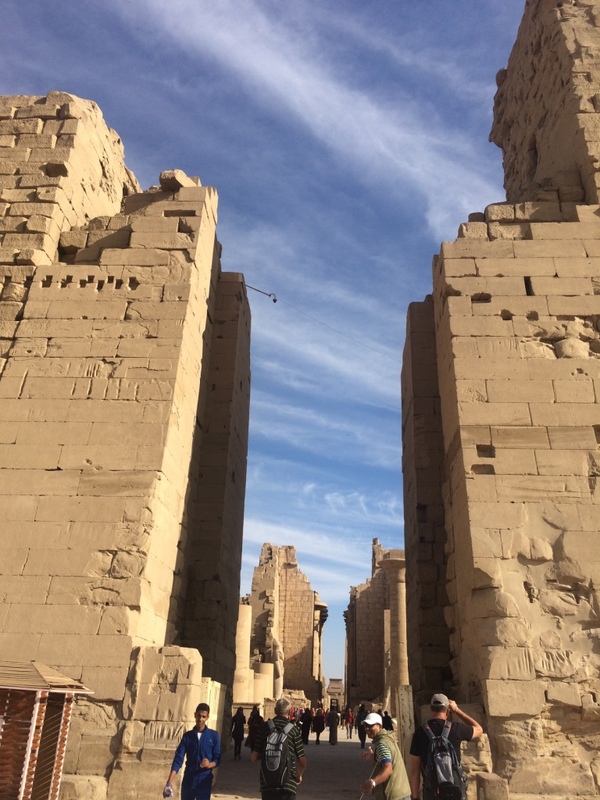 Next, we hit up Luxor Temple. 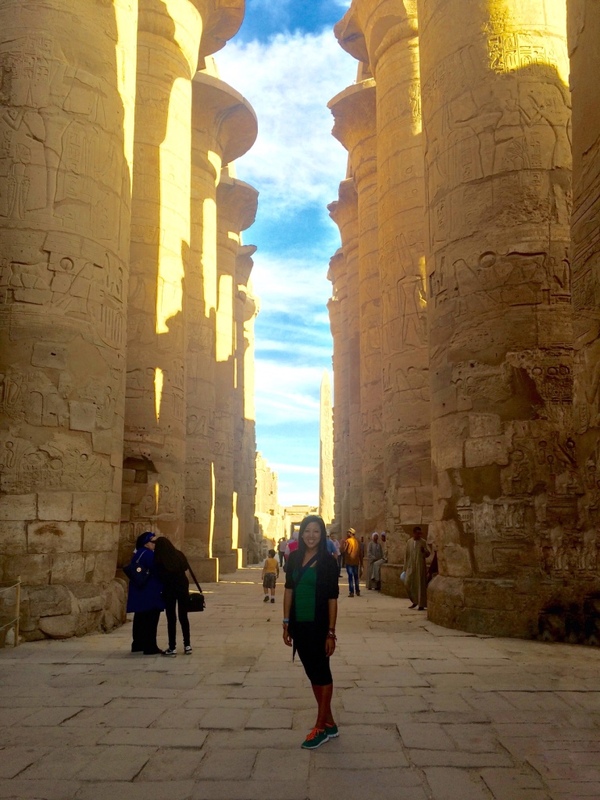 This temple is smack dab in the middle of the city of Luxor. Fun fact, it's gorgeously lit up at night if you decide to take a stroll past. 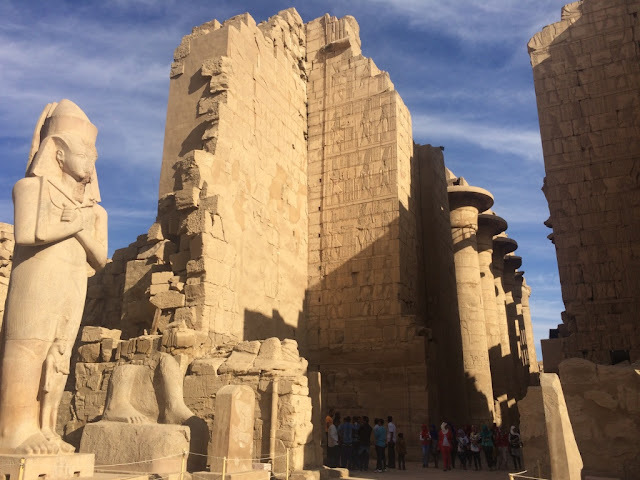 Luxor was built around 1400 B.C. and has been in almost continuous use as a place of worship since. Various other religions have set up shop in the temple in the ages since it was constructed, including Coptic (Christians) and Muslims. 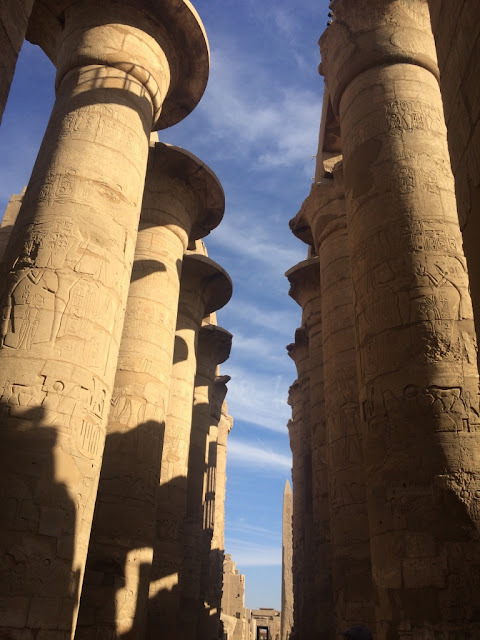 In Luxor's own hypostyle hall, there are 32 columns (step it up, Luxor). 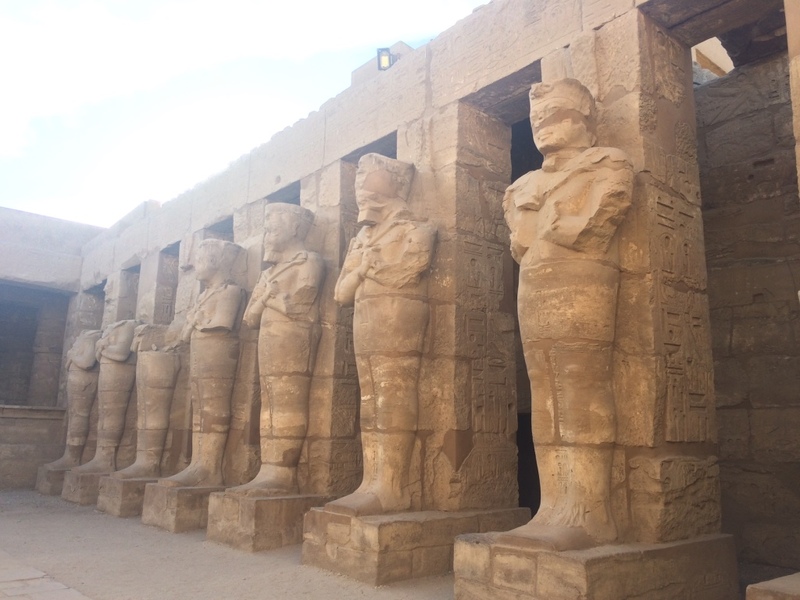 Pretty sure the two giant statues at the front are Rameses II. Or I just default to him when I can't remember. 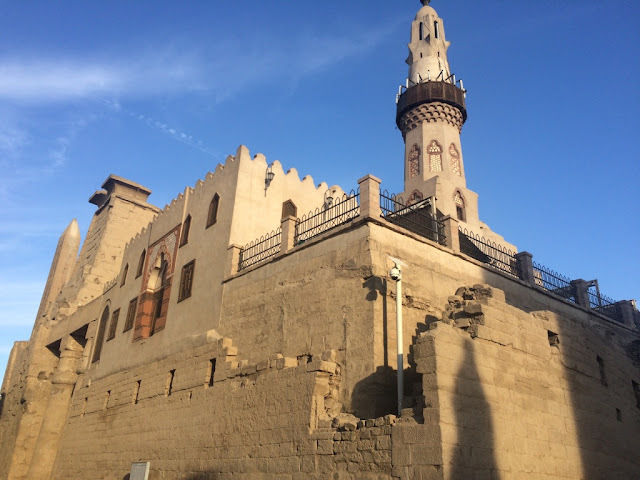 Craziest story is this mosque that was built on top of the ruins (before the temple was excavated) in the 5th century A.D. 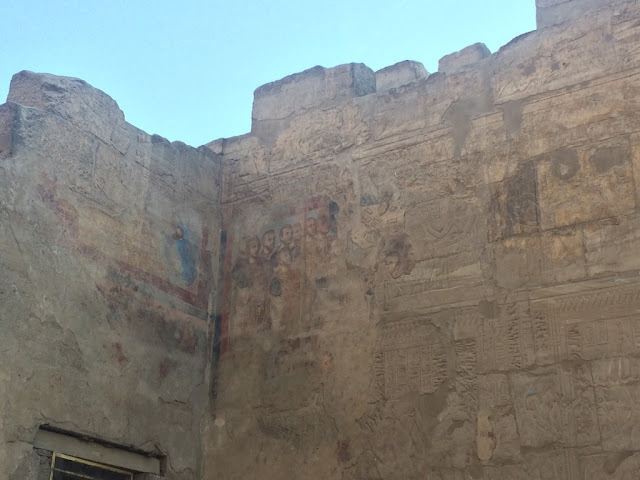 If you look to the left side, you'll see what used to be the entrance door to the mosque (framed in brown) - that's how buried the ruins used to be! When they excavated, the mosque stayed intact but now the original entrance is super high up. It's still in present-day use, with a different entrance. 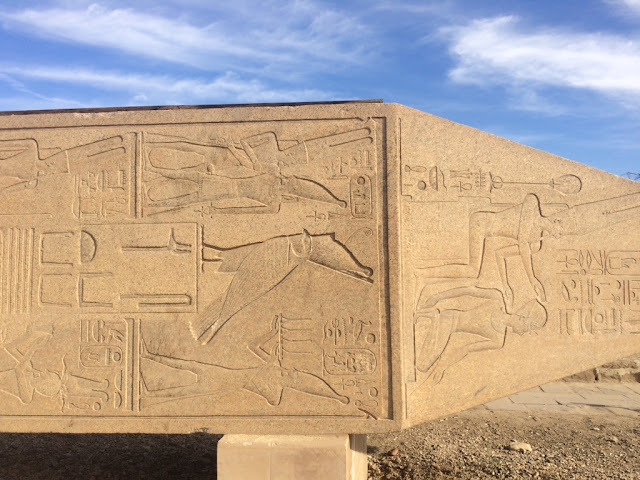 On the Rameses II statue, he had carvings of all his enemies he defeated in the bottom row - you can see their hands are tied behind their backs. These are enemies from the East, as you can see from their facial features. 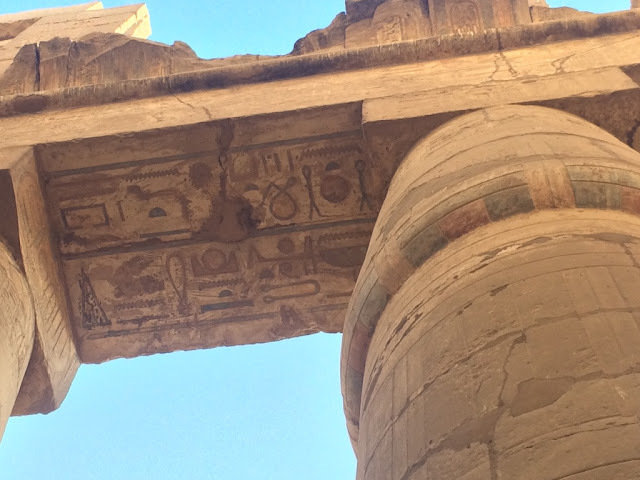 On the other statue, it shows the enemies from the South, because they have completely different features than the ones in the photo above (hair, earrings, lips, eyes). 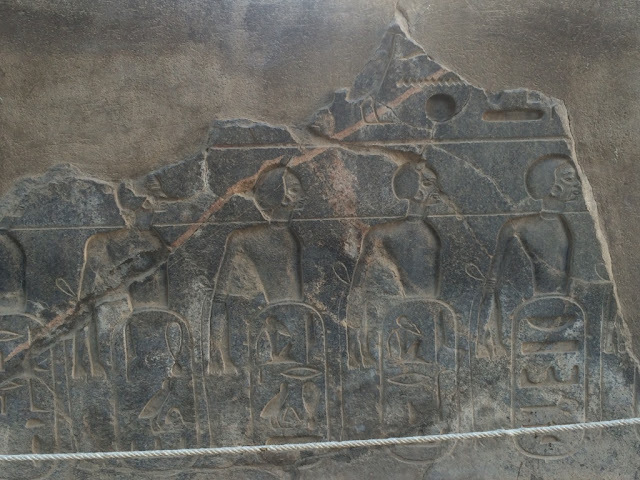 These show the Nubians, which is how you know they're the enemies from the South. The goddess of measurement. 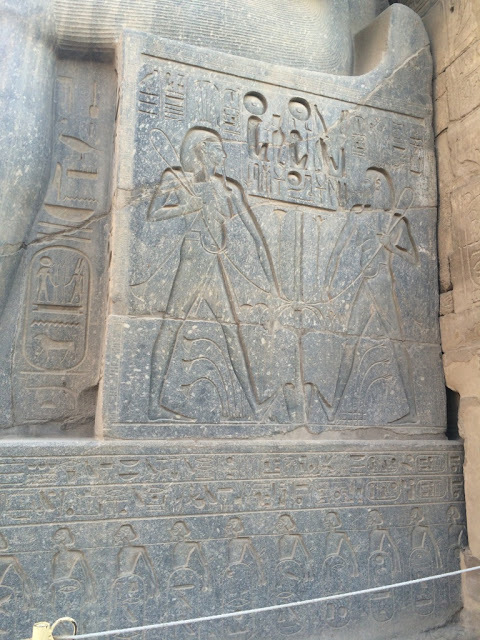 This carving is impressive due to the care, attention to detail, and prettiness of the work. 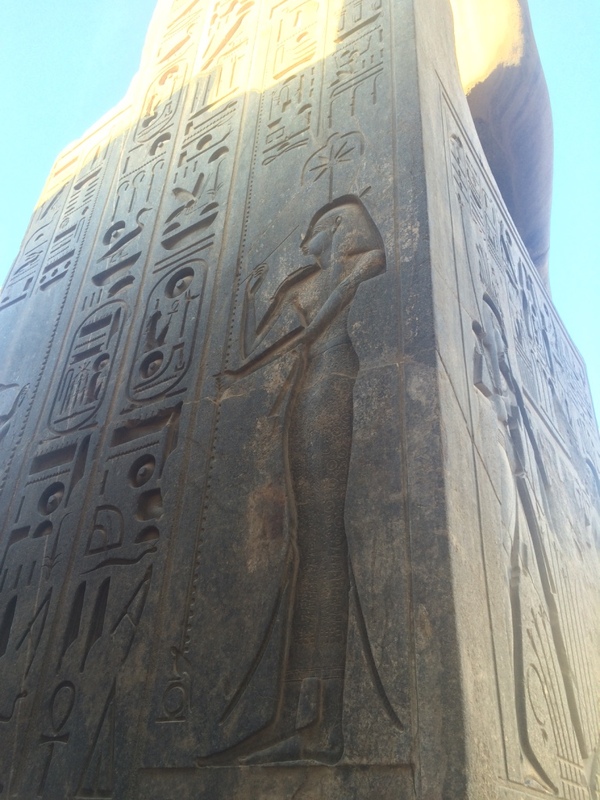 Not quite sure why the goddess of measurement is so important, but not questioning it. 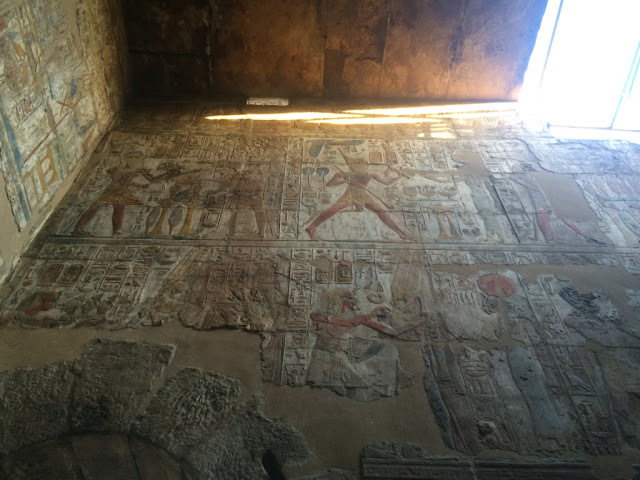 And in the back, they tried to cover up the Egyptian hieroglyphs with Christian paintings when they turned it into a church. Super weird seeing Jesus in color over these super old carvings. 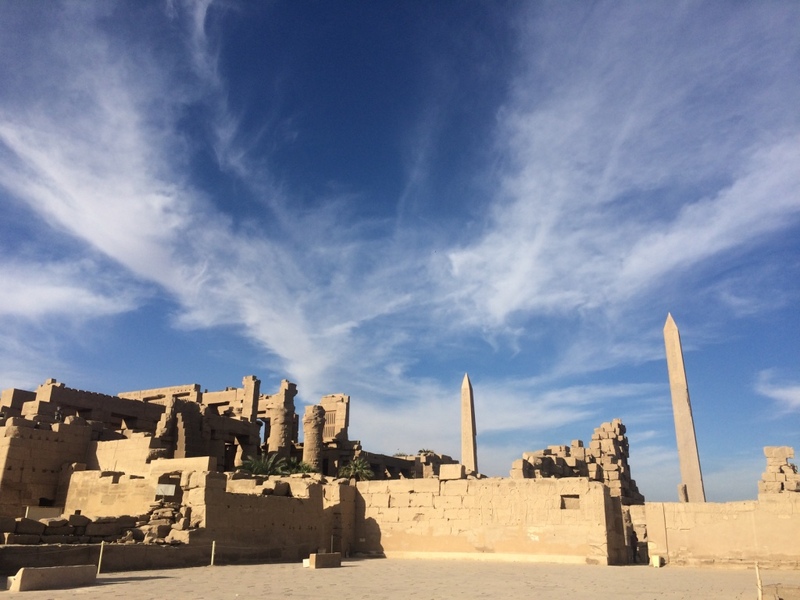 Given the drop in tourism and the already-low salary base, many Egyptians are always looking to make an extra buck. 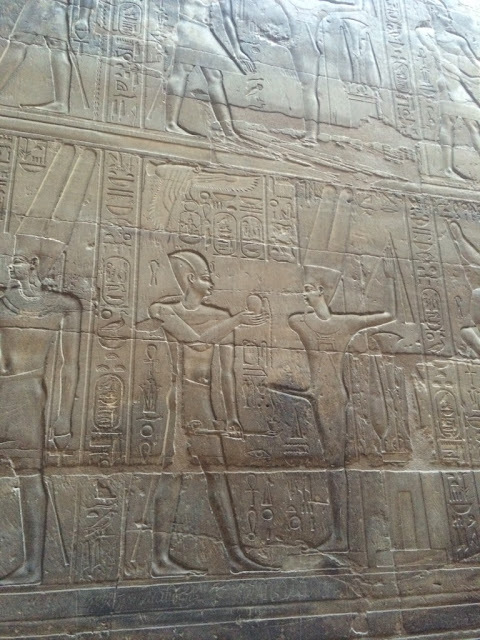 In many of the sites, you're not allowed to take photos of the interior (especially in tombs, etc.) for fear of damage. 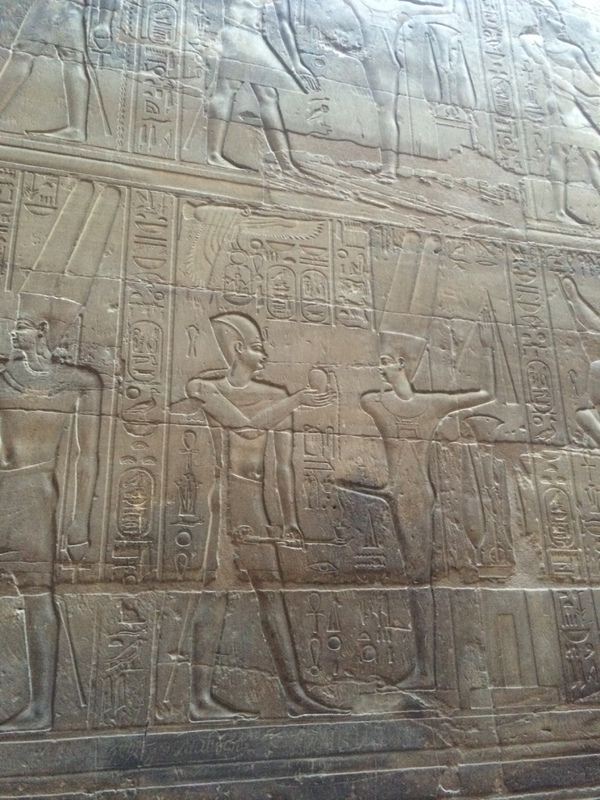 There are always employees enforcing these rules inside - however, 99% of the time, they will secretly offer to let you take photos for a tip (or they'll aggressively hoist you into a 5,000 year old tomb for a tip - as you saw in Cairo). Or as you're wandering around, you'll often encounter a random man who will try to give you special tips/advice, or lead you into another part of the temple - all for the expectation of a tip at the end. You have to really get used to saying "no" here. And always being on your game. I'm exotic here! Especially with groups of university students - they love saying hi and staring at you or taking secret photos of you. The other day, a group of giggling girls asked to each take a photo with me. UM OF COURSE. Everything needs bargaining here. Every. single. thing. And it's really aggressive bargaining, like cutting things by 50% or more usually. This includes hotels, tours, taxis, goods, tips, food, etc. Everything. Time to brush up on those bargaining skills.